We are dreaming of cooler temperatures here in the sunshine state. I am so excited about this weekend as it marks the first of fall in our home: football season. Then comes fall decor, potted mums on the doorsteps, yummy spiced scents reminiscent of the holidays, and of course all things pumpkin! Like I said, I am beyond giddy about fall approaching! 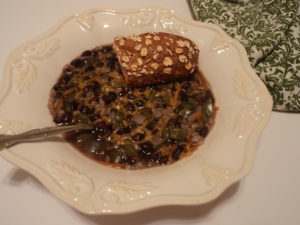 Tonight for dinner I made a quick and simple black bean soup. It was so scrumptious I had to share it with you guys. It’s light enough for summer time yet perfect for warming up as the weather begins to cool off. Add chopped veggies to heated stock pot with 1 tablespoon olive oil. Saute until softened, add spices, vegetable broth, black beans and bring to a boil. Add rice, reduce heat to simmer, and cover for at least 20 minutes. Enjoy with crusty baguette and cheddar cheese if desired. Do you love fall as much as I do? What are you looking forward to about the season? @Regan WAR EAGLE! Are going to any games this fall? @Rachel…let’s hope FL cools off soon. Fall is my favorite, I am eagerly anticipating cooler weather.